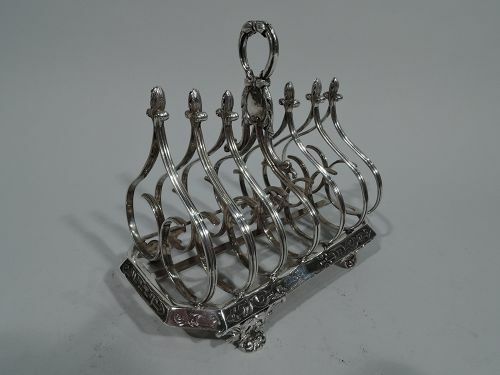 Regency Gothick sterling silver toast rack. Made by Charles Thomas Fox & George Fox in London in 1835. Seven double-scroll partitions with fleurs de lys terminals and central open wreath finial mounted to rectilinear frame with chamfered corners and shaded strapwork ornament, and plain central stretcher on 4 leafy-scroll supports. An elegant addition to the breakfast table. Fully marked. Very good condition.